Planning the perfect getaway can be overwhelming. In Granbury, we want the stress of planning to be the least of your worries! Check out some of our easy itinerary guides to make your stay unforgettable. Have questions or want to change something around to best fit your party? Not a problem! 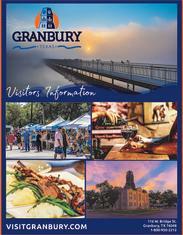 Call or stop by the Visitors Center, we would love to help you find options in Granbury to best fit your stay. See you soon! Granbury and the surrounding area is well-known for it&apos;s amazing courses to spend the day on! See our list of golf courses to find the perfect spot for you. Take a break at a local restaurant or lodging accommodations. It&apos;s the perfect golf getaway! Granbury has so much rich history, and many museums and tours to show it off. There are many tours you won&apos;t want to miss out on. Visit the Granbury Ghosts & Legends Tour, the Hood County Jail Museum, the plot of the notorious Jesse James, and much more. While you&apos;re here, you can even stay in the historic Nutt House Hotel, built in 1893, and right on the Historic Granbury Square. Granbury is a wine destination. Many wineries call the area home, even a Saturday winery tour! Enjoy the local tastes and then stay at a quaint cabin or B&B for the ultimate stay. Plan your wine weekend in April to take part of the famous Granbury Wine Walk!